The SimplyHome Check-in Service and Responder App enable providers, families, and caregivers to streamline client care from any mobile device. Optimize schedules, assign tasks to caregivers, and foster accountability through time- and location-stamped documentation. This service is designed to benefit every level of your organization, from management to direct support staff. Family caregivers can also utilize the app to coordinate responsibilities and multiple caregivers. The Check-in Service and Responder App allow you to plan, accomplish, and verify care, empowering individuals in a variety of supported living settings. Designed to promote the independence of the individual, this service eliminates unnecessary staff visits for clients seeking greater independence and community integration. Choose how to start each day with a snapshot of your upcoming check-ins on the Responder App. Prioritize the check-ins that require your attention and respond accordingly. The client's care team can access the secure web portal to update time frames, control who is receiving alerts, and see the in-depth history of each scheduled check-in. Authorized users can track trends over time to make sure that each individual is receiving the appropriate amount of support. Make sure your clients receive the support they need to live independently. The Check-in Service verifies the time and date of the staff or caregiver's visit. If the Responder App is used with Bluetooth beacons, it also verifies the physical location of the visit. The app also enables caregivers to document the type of services provided. The Check-in Service and Responder App enable providers to make sure that clients are receiving the support they need within an appropriate time frame, enabling client independence, peace of mind for the client and family, and accountability within the entire caregiving team. To access the User Guides for the Responder App and dashboard, go to our Troubleshooting (FAQ) page. How do I get started using the Responder App? How do I get a username and password? Contact our customer service team by filling out the Request More Information form, in order to sign up for the monthly Check-in Service and to order beacons (which are necessary to perform location verification). After you receive your username, password, and beacons from SimplyHome, you will download the app on the Google Play or iTunes store, and enter the username and password you received. Is the Responder App EVV-compliant? 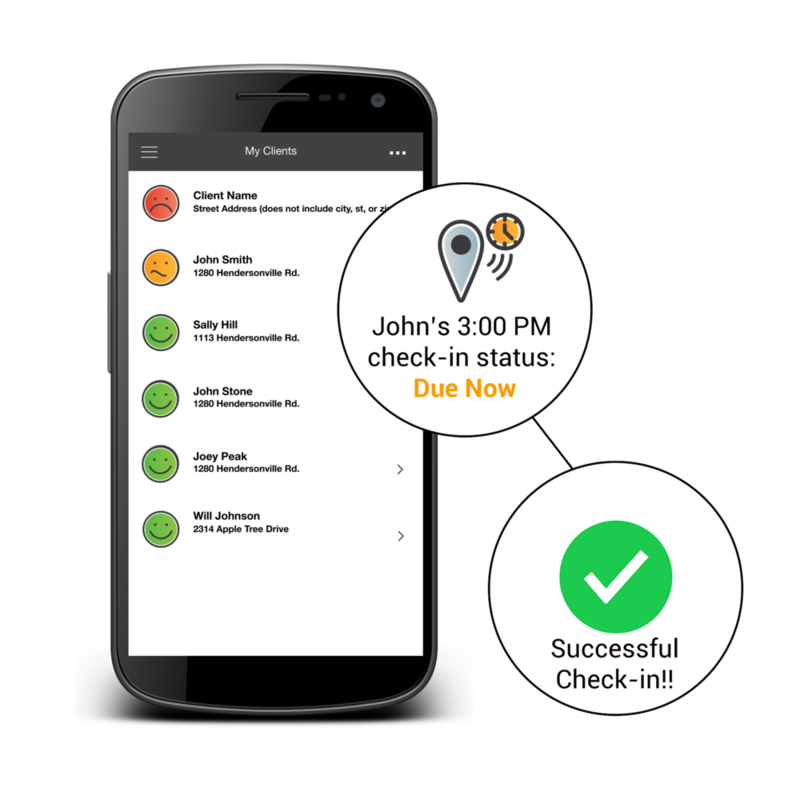 The Check-in Service and Responder App do meet the basic requirements of EVV, documenting the date of service, the location of service (if beacons are utilized), individual providing service, type of service, individual receiving service, and time stamps (via check-in and check-out, if used). The Check-in Service and Responder App is a solution that is focused on supporting the individual, rather than a staff time and attendance or payroll solution. What type of device do I need to access the SimplyHome Responder App? The app is compatible with Android and Apple smartphones and tablets. The Android operating system must be 4.1 or later, and the Apple device must be iOS 10 or later (iPhone 5 or later). Additionally, the device must have either a cellular or Wi-Fi connection at all times while using the app. The device must support Bluetooth 4.0 in order to validate location using beacons. Who is the Responder App intended for? The app is intended to connect providers and caregiving teams with the individuals they support, empowering highly customized care for each individual. Whether your goal is to document staff presence at specific times or specific locations, or simply to prioritize check-ins with multiple clients, the Responder App gives you the flexibility to do that from anywhere, in the midst of a busy workday or a high-paced environment. Do I need to use the SimplyHome System or other SimplyHome technology to use the Responder App? No, the Responder App can be used as a stand-alone system to document check-ins, check-outs, and tasks completed by staff. However, in order to use location verification, you must utilize proximity beacons with the Responder App. Is it possible to manage multiple people on one dashboard? Yes, if you are a caregiver or staff member supporting multiple clients or multiple locations, you should be able to see all your clients in the Responder App. These clients must be set up by the administrator using our secure web portal. How do I create a new check-in or edit an existing check-in? Authorized users can easily update the responders and the check-in days/times on our secure web portal. Our Customer Service team is available to assist authorized users with these changes; email us at help@simply-home.com. What exactly is a beacon? Beacons are small wireless devices that can be placed on flat surfaces (such as doors and walls) in a client’s location. They use Bluetooth low-energy transmitters to communicate a signal that contains location-specific data. When a responder’s smartphone (or tablet) detects the Bluetooth signals, the app is able to document whether the responder is in the same room as the client (or in the same home, depending on how it was configured on the web portal). Beacons are available for $49.95/beacon (including programming fees). What is a beacon’s range? The typical range of Bluetooth low-energy radio modules is anywhere from 1 meter (~3 ft.) up to 200 meters (~650 ft.). Our beacons have two settings: documenting whether the responder is in the same room (close range), or documenting whether the responder is in the same home (slightly less close range). Who receives notifications about check-ins, and how do they get these alerts? During the setup process on the web portal, you will customize your list of responders, and select whether each person is alerted when a check-in is due or late. Both email and text alerts are available. You may list as many people as you would like on your contact list. Can beacons be placed outdoors? The beacon is encased in soft silicone, which is splashproof, but not waterproof, should water enter the beacon underneath the adhesive. You can install them outdoors, but please note that Bluetooth radio signals are heavily absorbed by water, so rain will reduce the beacon’s signal strength. Also, consider that operating beacons in temperatures over 60°C (140°F) or below -10°C (14°F) can reduce battery life. How long does a beacon’s battery last? Inside each beacon is a non-rechargeable lithium battery. A beacon’s lifetime depends on its configuration. At default factory settings, beacons last anywhere from 3 to 5 years. However, this ultimately depends on how frequently the beacon is used. What about privacy with the app? Client data is stored securely in the cloud and is accessible through the secure web portal. The Responder App and web portal do not store client data per se, but request data from our servers on demand.